Over recent years Dan Guilfoyle, a senior associate in RPC’s insurance litigation team, has noticed a significant uptick in requests for detailed management information insurance company clients. This use of big data to develop models that better manage the present and predict the future goes to the heart of insurtech, an area that combines insurance, law and computer science. With insurance having a reputation as quite a traditional industry that may in the past not have embraced technology as wholeheartedly as others, some commentators have expressed views about the “disruptive” impact of insurtech on the sector. But Guilfoyle doesn’t expect a revolution. Rather, he forecasts that insurance will be “gradually enhanced” by technology in a way that makes it “more streamlined and most importantly more accurate at calculating risk”. He adds that this “will benefit everyone — the industry, its service providers and the people and organisations taking out insurance”. Specialising in construction and technology disputes and cyber breach response, Guilfoyle gets to see litigation from plenty of different perspectives. His experience advising technology companies has been particularly useful as RPC embarks on its own entrepreneurial and innovative ventures. It’s no surprise, then, that Guilfoyle has played a key role in the development of ReSecure, RPC’s cyber security breach response service. The initiative provides a one-stop shop for companies which suffer a security breach, and sees the firm’s lawyers act alongside tech experts, forensics teams, PR consultants and credit monitoring specialists to quickly limit the damage. Guilfoyle also takes a keen interest in lawtech. “All businesses, small and large, are ever reliant on electronic communication. That, along with the ease and frequency with which people send emails, means that litigation cases routinely involve a significant number of documents that would add up to countless lever arch files. This is where eplatforms are playing an increasingly important role; the ability to interrogate the documents at the click of a button, be it through key word searches or date ranges makes the review process much more efficient and cost effective,” he says. A Cardiff University history and politics graduate, Guilfoyle was drawn to the law because he was “attracted to the process of marshalling a range of circumstances and facts in order to construct a particular position or argument”. Having tried a range of different practice areas during his training contract, he found that litigation offered a pretty pure embodiment of that analysis and argument combination. Plus it proves to be very satisfying. “When you are able to extricate a client from a difficult position, reach a favourable outcome or succeed at trial — then all the hard work is worth it,” he says. 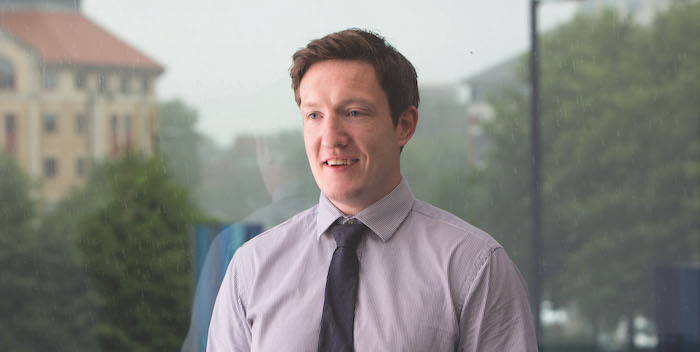 Having joined RPC’s Bristol office from another large firm in 2012, he hasn’t looked back, managing the pressure of the day job by taking time out to follow club and international rugby. Dan Guilfoyle will be speaking at InsurTech, the law and new opportunities for future lawyers at RPC this evening, alongside colleagues Simon Laird and George Barratt. Find out more about RPC on Twitter and Instagram.